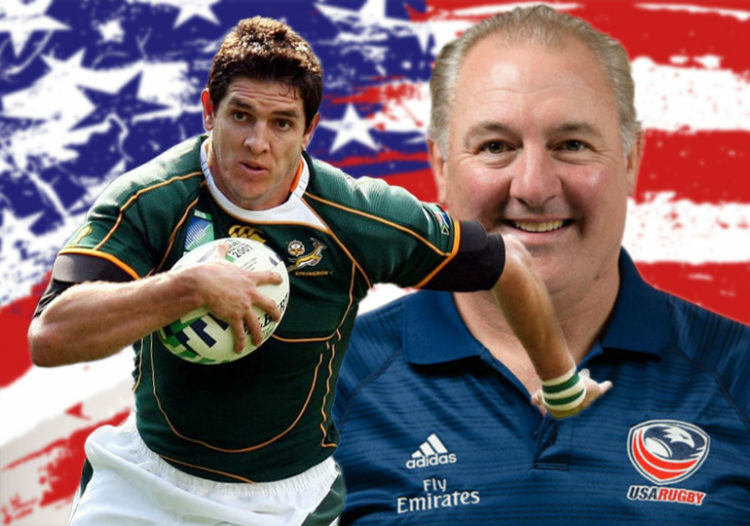 Jaque Fourie’s coaching career shifted gears on Thursday when the former Springbok joined Gary Gold’s USA Eagles management team as the new defence coach. “We are thrilled to have Jaque Fourie join our coaching team as we dive deep into the Rugby World Cup year,” said USA Rugby GM, Dave Hodges. “The defensive coaching position is critically important to us as we work to ensure our team is fully prepared for what will be one of the most competitive World Cups yet. While Fourie officially cut his teeth as a defence coach with the Western Force in 2017 after a glittering 15-year professional playing career, he was one of several Test veterans who assumed coaching responsibilities in the player-led Springbok side that clinched famous victories between 2008 and 2011. He earned 72 Test caps between 2003 and 2013, teaming up with Jean de Villiers 29 times in South Africa’s most-capped centre combination for a haul of career achievements that included winning the 2007 Rugby World Cup, the 2009 Tri-Nations, and a series-victory against the British Lions. The big-bodied centre was revered as a lethal finisher and, together with his ruthless efficiency as a marshal in the wide channels on defence, Fourie was the benchmark at outside centre during the peak of his powers. That spatial awareness also aided Fourie off the field where he recognised that rugby’s financial tryline was shifting north and east, and in 2011, at the age of 27, Fourie accepted what was reported to be a R22m deal over three years to join Panasonic. Rassie Erasmus, head coach of the Stormers at the time, had grown weary of Western Province’s meddling elected-officials and such was the quality of Fourie that the player’s decision to head for Japan helped Erasmus make up his mind that it was time to leave Newlands. Fourie’s appointment may have been based on his legendary status as a player as much as it was on his defensive expertise; the official press release highlighted that his “ability to relate as a former player will be a significant benefit to the Eagles”. First up for Fourie is the Americas Rugby Championship match against Chile on February 2. The USA were drawn with England, France, Argentina and Tonga in Pool C of the 2019 Rugby World Cup. It is always good to see South Africans making a success of things and there are a number that are flying just under the international radar. Dave Wessels at The Rebels must surely be a candidate to succeed Cheika and Johan Van Graan is doing wonders at Munster. I am sure they will be rewarded in time! “… player-led Springbok side that clinched famous victories between 2008 and 2011.” LOL!! Nice little swipe at P-Divvy there. But true, and obviously acknowledged in the higher echelons of the sport as he has had zero opportunities worth mentioning since. Let’s face it,-if he was any good some club in France, England or Japan would have snapped him up. Or are they ALL just racists?